Consequently the crew and I are considering taking some shore leave here in Port Regal for a little while. Especially since it was a bit of a journey getting here. In my last entry, we were picking up some items for Don Rafael in hopes of getting his spirit to help us with locating Captain Blood’s treasure. We’re still in search of the missing pieces of Marco Pollo’s map. 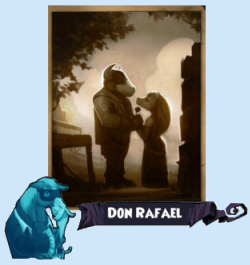 Thanks to Scratch we were able to talk with Rafael, but as usual information has a price. He wants a favor before he’ll tell us about Blood’s treasure. It seems his adopted son Don Rodrigo had fallen in love with Rafael’s daughter, Carolina. In secret Rodrigo trained he beloved how to fence and shared with her the hidden knowledge of El Toro. He also asked Rafael for her hand in marriage, but the elder Don refused, telling his adopted son it was too dangerous. When Rafael discovered their subterfuge he denounced Rodrigo and fled his home. Carolina too left Santo Pollo in an act of defiance, leaving her beloved Rodrigo alone and broken-hearted. Now Rafael is in spirit and he has asked us to local his lost daughter and give her his blessing to mend her broken heart. But it seems we have already meet Carolina, though we know her as Mustang Sally. About the same time we discovered a message in a bottle from our old friend One-Eyed Jack. Seems Jack picked up a new ship that he wanted us to try out. If we liked it, we could keep it and tell all the Captains we meet about its abilities. The ship comes from a land called VisionTek where a new class of VisionTek Ships can be found. We took his message to the Ship Builders and picked up our new vessel last month. She’s a heavy Galleon with some wonderful cannons, a kewl figure-head, massive sails and an able wheel and rudder. We have dubbed her the Blazing Cutter as she cuts through the skies with great speed and ease. She’s been fantastic in a fight and holds her own against some pretty tough competition! On our new ship, we sailed back to the Flotsam Skyway to locate her and deliver her father’s sentiments. Only we discovered that Sally has taken on a special quest that lead us to a Monquestan ship sailing near the Scurvy Dog Hideout. We discovered the ship was Captained by our old friend Gortez who kindly shared what information he had. That lead us to Captain Dan in the Hidden Temple at the Scurvy Dog Hideout. As with others, to get information we must pay a favor. From battling troggies to capturing a Monquistan Captain who has played havoc with the Marleybone Royal Navy. He will be our ticket into Port Regal. First we needed to get his attention to locate him for battle. We were off to Monquista to defeat the Royal fleet. Sure enough got us an invite to face Count Brass, also known as the Brass Monkey in the Antilles Maelstrom. Well he turned out to be a bit of a blowhard. All mouth and little action. With the “brash” Monkey in hand we delivered him to Marleybone Governor in Port Regal. This entry was posted on November 24, 2013, in Captain's Log and tagged captain, game, hints, Kid friendly, kid safe, locations, log, online, Pirate101, Pirates, portal, quests, role play, ship, vessel. Bookmark the permalink.